Asking for help is never easy. 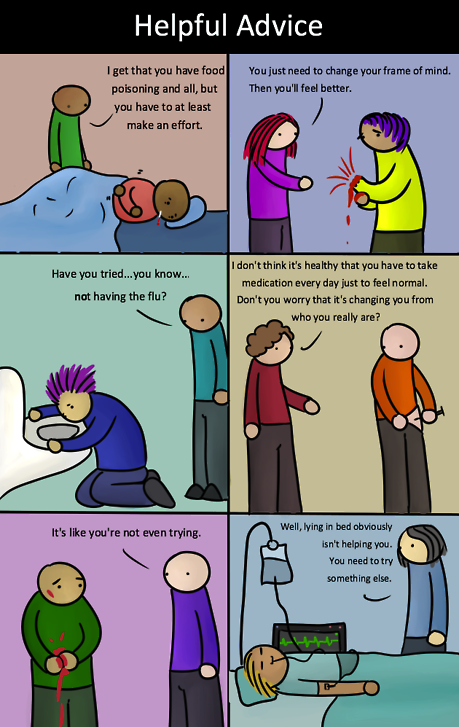 It’s especially difficult when you suffer from a mental illness because of the stigma that is attached to it. There are a number of factors that deter people from reaching out for help, that can include anything from shame, to fear of being institutionalized or hospitalized against their wishes, to being judged or unsupported by those around them, to simply not wanting to say what they’re going through because it makes their struggles that much more real. Mental illness, and especially depression or suicidality, come with the incredible burden of unnerving isolation. The loneliness in our minds, existing because of a great wall built by our depression, makes us retreat further into our minds, much like a hermit crab does when they fear for their safety. The next question posed is, how do we help people who cannot come and ask for help, or make it known that they need help? There is a great deal of work that needs to be done in this area, but I must say that the emergence of not only websites or virtual resources, but smartphone apps especially, have made it much easier for those who need help to seek it out. Something I can’t emphasize enough…knowing what not to say, and how to say what you should say is essential in trying to provide a strong support system for someone struggling with any mental illness. Every single point in this article is so accurate. I’d like to start this post by apologizing to my frequent readers. I know it’s been weeks since I last wrote a post (about 8 if we’re counting) but I felt like my content was becoming repetitive, and I didn’t quite know the words I wanted to say, so I chose to say nothing at all. It’s ironic – part of the reason I started this blog was because those who struggle with mental illness often don’t know the words they want to say and opt to say nothing at all. It’s much easier to say nothing, than to say something and be unsure of it. The thoughts that are in your head are yours, and if they make no sense, it’s okay because it’s just for yourself. But, once you speak, those words become real, and their corresponding thoughts transcend from ideas to reality. I opted not to finish the 30 day challenge, because the questions became repetitive, and I do not write to be boring, or at least, I try my best not to. I’ll keep this post rather brief, because I don’t have much to say, but felt I owed it to myself, and my readers, to reengage with mental health awareness. I watched a brilliant movie tonight, and for those of you who know me well, you’ll know that movies are my escape of choice when I really need to get away, or deal with reality in a different way. Today, I watched “Call Me Crazy: A Five Film”, which consists of 5 mini stories, each about a person struggling with a mental illness in their own way, from depression, to schizophrenia, to bipolar and others. Because I am doing so well, it had been awhile since I really thought about much bigger struggle I faced not too long ago, but it served as an important reminder that I’m doing the best I can, and that’s really all that can be asked of me. If you have a couple of hours, or 89 minutes for those with more limited time, please please please watch this movie. It’s honest, it’s raw, and most importantly, it addresses some issues which are very close to my heart. I had three main takeaways from this movie, and I want to share those, as they are incredibly important for everyone to remember. 2. Mental illness affects the person with the illness the most, but family and those close to the person with the illness are not unaffected. Often times, the family gets hurt or has to suffer in their own way, regardless of how hard the person with the illness tries not to hurt people. It’s not easy, and often families need support too, on how to deal with their own emotions, and how to best help the person they love that is suffering every day. 3. Mental illness does not discriminate. What I mean, is that there is no specific type of person a mental illness can effect. The illness does not pick and choose, or prey on those that are weak, but rather can hit any person, at any time. More often than not, mental illness creeps up on the people you would least expect it to – and it can be quite shocking to find out about. I’d request that if you’re reading this, take a moment, and think about anyone you know who has or has had a mental illness. Think about them, and ask yourself, do they know they are loved? Do they know they are wanted? Do they know this isn’t their fault? Do they know they’ve done nothing wrong, or nothing to deserve this? If the answer is no to any of these questions, tell them. Because I can tell you, there have been countless times where I’ve felt unloved, unsupported, but most importantly, I felt that I was responsible for being sick, and that it was my fault. I’m lucky enough to have a wonderful support system that has made me realize better, but many people are not as fortunate. .